New Syrian peace will introduce gradual cessation of hostilities and delivery of humanitarian aid. Major world powers agreed overnight Thursday to a plan aimed at breaking the deadlock in Syria, Reuters reported, citing a diplomatic source. According to the source, the plan would introduce a gradual cessation of hostilities and quick humanitarian aid in the country with a view to creating conditions to revive peace talks. "We did not get a deal on the immediate end of Russian bombings, but we have a commitment to a process that if it works would change the situation," a Western diplomatic source told Reuters. Speaking about the deal and quoted by AFP, U.S. Secretary of State John Kerry said the ministers who met for talks on the Syria crisis agreed to seek a full cessation of hostilities within one week's time. 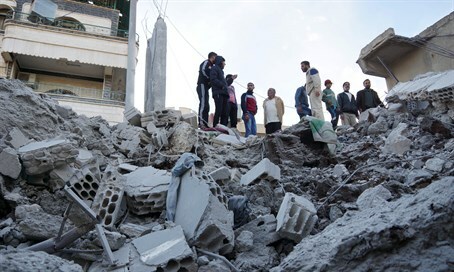 The working group of 17 countries meeting in Munich agreed "to implement a nationwide cessation of hostilities to begin in a target of one week's time," he was quoted as having said. They also agreed to immediately "accelerate and expand" humanitarian aid to the war-torn country. "Sustained delivery will begin this week, first to the areas where it is most urgently needed... and then to all the people in need throughout the country, particularly in the besieged and hard to reach areas," Kerry said, according to AFP. He also said peace talks between rebels and the Syrian government would resume in Geneva "as soon as possible". The talks were derailed earlier this month as the regime began bombarding the key rebel city of Aleppo with support from Russian bombers and Iranian fighters, triggering an exodus of over 50,000 refugees. Kerry also said that a UN task force will be set up to ensure humanitarian access is granted to all sides, according to a BBC report. He admitted, however, the ceasefire plan was "ambitious" and said the real test would be whether the parties on the ground honored the commitments. Kerry made the announcement alongside his Russian counterpart Sergei Lavrov and the UN special envoy for Syria, Staffan de Mistura.